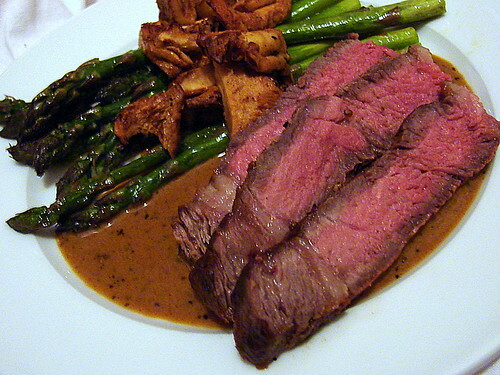 Friday’s dinner was a grass-fed ribeye with a sherry-peppercorn pan sauce and roasted asparagus and hedgehog mushrooms. 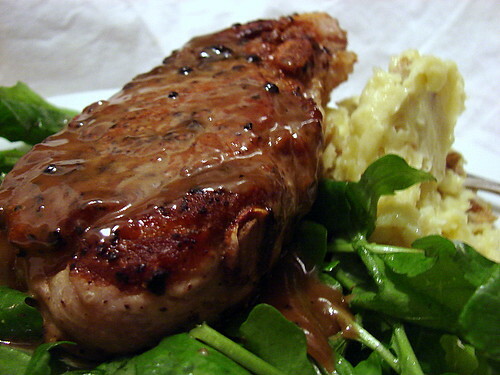 Saturday’s dinner was chops from Flying Pigs with a maple-bourbon pan sauce, garlic mashed fingerlings and arugula with mustard vinaigrette. Both meals were simple and pretty straightforward; Mike cooked the proteins, and I did the sides and pan sauces (I could write up the technique here, but Derrick has already posted what is probably the best pan sauce primer out there). We had a really spectacular wine with the steak on Friday night, a bottle of Chateau Le Loup 2000 Saint Emilion Grand Cru which I picked up at Grande Harvest. It had a beautiful ruby color and an almost silky mouthfeel, rich berry flavors with a little hint of licorice and vanilla – a really elegant wine.